The image is not very clear because it was wriggling so much, but perhaps somebody can figure out what the remnant of the other creature is. See comments under the adult image. Moved from Unidentified Pupae and Cocoons. What comes to me is something Charley taught me last week. I had a little ichnemon coccon and it hatched, so I stuck it in the refer to cool it to take a picture. When I posted the picture it was a parasite of a parasite which had emerged. or as Charley put it, "Parasitoid: So this is a parasitoid of the campoplegine ichneumonid that made the cocoon. A caterpillar-killer-killer"
is what he said, and thats my guess..... altho it would be a gall maker killer. A true parasite doesn't normally kill its host, so something that feeds like a parasite but kills its host is called a parasitoid. A parasite of a parasite is called a hyperparasite. A parasitoid of a parasitoid is a hyperparasitoid. Moved from Gall Midges. 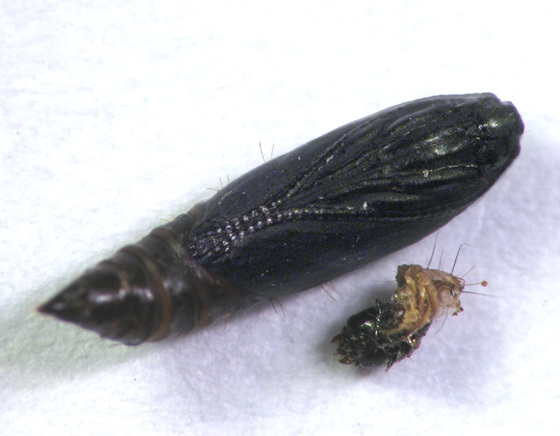 Lepidoptera pupa plus exuvia of last instar of caterpillar. I have so much to learn! With a lot of luck I might get to see the adult.